Meskhidze, N. et al., 2013 , Production mechanisms, number concentration, size distribution, chemical composition, and optical properties of sea spray aerosols, Atmos. Sci. Let., 14, 207-213, DOI: 10.1002/asl2.441 [Abstract] [pdf]. Anguelova, M. D., and P. W. Gaiser, 2012, Dielectric and radiative properties of sea foam at microwave frequencies: Conceptual understanding of foam emissivity, Remote Sensing, 4, 1162-1189, doi:10.3390/rs4051162. [Abstract] [pdf]. Anguelova, M. D., and P. Huq, 2012, Characteristics of Bubble Clouds at Various Wind Speeds, J. Geophys Res.-Oceans, 117, C03036, doi:10.1029/2011JC007442. [Abstract] [pdf]. Anguelova, M. D., and P. W. Gaiser, 2011, Skin depth at microwave frequencies of sea foam layers with vertical profile of void fraction, J. Geophys Res., 116, C11002, doi:10.1029/2011JC007372, [Abstract] [pdf]. de Leeuw, G., E. Andreas, M. D. Anguelova, C. Fairall, E. Lewis, C. O'Dowd, M. Schulz, S. Schwartz, 2011, Production Flux of Sea-Spray Aerosol, Rev. Geophys., 49, RG2001, doi:10.1029/2010RG000349 [Abstract] [pdf]. Bobak, J. P., W. E. Asher, D. J. Dowgiallo, and M. D. Anguelova, 2011, Aerial Radiometric and Video Measurements of Whitecap Coverage, Trans. Geosci. Rem. Sens, vol.49, no.6, pp.2183-2193, doi: 10.1109/TGRS.2010.2103565 [Abstract] [pdf]. Stoyanov, D. V., B. M. Bratanov, M. D. Angelova, 1991, The use of Tracking Heterodyne in Infrared Doppler Lidars, Compt. Rend. Bulg. Acad. Sci., 44, No. 2, 25-28. Angelova, M., A. Donchev, I. I. Zasavickii, U. V. Kosichkin, T. Krustev, A. I. Kuznecov, A. N. Perov, S. P. Penchev, E. V. Stepanov, A. N. Filipov, V. Tzanev, A. P. Shotov, 1986, Automated trace gasanalyzer based on tunable diode lasers and its application for investigation of atmospheric pollution dynamics, Short notes on Physics, No.10, 36, (in Russian). Burrage, D. M., M. D. Anguelova, D. W. Wang, and J. C. Wesson, Predicting Radiometric Effects of a Rough Sea Surface, Whitecaps, Foam and Spray Using SURFER 2D, IEEE J Selected Topics Appl Earth Obs Remote Sens (JSTARS), under review. Means, S. L., D. J. Dowgiallo, P. A. Hwang, A. H. Callaghan, J. A. Schindall, J. P. Bobak, and M. D. Anguelova, Correlation of acoustic and radiometric signatures of oceanic whitecaps, TBD, in preparation. Anguelova, M. D., D. J. Dowgiallo, G. B. Smith, S. L. Means, I. B. Savelyev, G. M. Frick, C. M. Snow, J. A. Schindall, and J. P. Bobak, Remote sensing signatures of oceanic whitecap at different wavelengths: A multi-instrument field campaign, Remote Sensing of Environment, in preparation. Anguelova, M. D., M. H. Bettenhausen, W. F. Johnston, P. W. Gaiser, First Extensive Whitecap Database and Its Use to Study Whitecap Fraction Variability, J. Geophys. Res.-Oceans, in preparation. Anguelova, M. D., Ben I. Moat, Robin W. Pascal, Margaret J. Yelland, Comparison of Satellite-Based Estimates and Ship-Borne Observations of Whitecap Fraction, Remote Sensing of Environment, in preparation. Bobak, J.P., W.E.Asher, D.J. Dowgiallo, M. D. Anguelova, 2008, On the correlation of area-extensive measurement of fractional area whitecap coverage with microwave brightness temperatures, MICRORAD 2008, 11-14 March , pp.1-4, doi: 10.1109/MICRAD.2008.4579493 [Abstract] [pdf]. Anguelova, M. D., M. Bettenhausen, P. Gaiser, 2006, Passive Remote Sensing of Sea Foam using Physically-Based Models, IGARSS2006, p. 3676 - 3679, doi: 10.1109/IGARSS.2006.942 [Abstract] [pdf]. Rose, L. A., J. P. Bobak, P. W. Gaiser, M. D. Anguelova, D. J. Dowgiallo, W. E. Asher, S. C. Reising, S. Padmanablan, 2006, Azimuthal Variation of the Emissivity of Foam From C and X Band Polarimetric Measurements, 2006 IEEE MicroRad, San Juan, pp. 125-130. Padmanabhan, S., S. C. Reising, W. E. Asher, L. A. Rose, P. W. Gaiser, J. P. Bobak, D. J. Dowgiallo, M. D. Anguelova, 2006, Azimuthal dependence of the microwave emission from foam generated by breaking waves at18.7 and 37 GHz, 2006 IEEE MicroRad, San Juan, pp. 131-136. Anguelova, M. D., M.H. Bettenhausen, K. St. Germain, P.W. Gaiser, R.M. Bevilacqua, 2005, Improved satellite retrievals of whitecap coverage and sea-salt aerosols, European Aerosol Conference, Ghent, Belgium, 28 Aug 2 Sep, p. 193 [Abstract]. Stoyanov, D. V., E. V. Stoykova, M. D. Angelova, B. M. Bratanov, 1993, New method for direct digitizing of wideband Doppler lidar signals, in Technical Digest on Coherent Laser Radar: Technology and Applications, July 19 - 23, Paris, France. Stoykova, E. V., M. D. Angelova, D. V. Stoyanov, 1993, Investigation of the effect of correlated noises on the PP algorithm estimate, in Technical Digest on Coherent Laser Radar: Technology and Applications, July 19 - 23, Paris, France. Stoykova, E. V., M. D. Angelova, D. V. Stoyanov, 1992, Pulse - Pair Doppler Velocity Estimator in the Presence of Correlated Noise, The VII Intern. School on Quantum Electr. "Lasers physics and applications", Sept. 27 - Oct. 2, Sofia, Bulgaria. Stoyanov, D. V., B. M. Bratanov, M. D. Angelova, 1991, Doppler detection at high instabilities of laser sources, in Technical Digest on Coherent Laser Radar: Technology and Applications, Snowmass, Colorado, 12, 223-225. Stoykova, E. V., L. L. Gurdev, B. M. Bratanov, M. D. Angelova, D. V. Stoyanov, 1990, Low Doppler Velocity Estimation in Infrared Coherent Lidar, The 15th Int. Laser Radar Conference, June, Tomsk, 413-417. Stoyanov, D. V., B. M. Bratanov, M. D. Angelova, 1990, Reference Channel for Infrared Doppler Lidar of Increased Laser's Instabilities, VI Intern. School on Quantum Electr. "Lasers: physics and applications", September, Varna, Bulgaria, 515-519. Penchev, S., V. Tzanev, V. Milev, M. Angelova, A. Kuznecov, A. Perov, A. Filipov, 1990, Measurement of carbon dioxide concentration in the planetary boundary layer with a laser gas - analyzer, XII Colloquium "Physics for human and environmental safety", June 1982, (in Bulgarian). Angelova, M. D., B. M. Bratanov, D. V. Stoyanov, V. N. Naboko, K. V. Apostolov, 1989, Investigation of intermediate frequency statistical characteristics of the reference channel in a coherent CO2 lidar, The IIIth Bulgarian - Soviet seminar "Laser and Radio methods of environmental control", October, 208, (in Russian). Anguelova, M. D., M. H. Bettenhausen, 2018, Effect of a Sea Spray Layer on Remote Sensing of Ocean Surface, Workshop on Remote Sensing for Studying the Ocean-Atmosphere Interface, 13-15 March 2018, Potomac, Maryland, USA [Abstracts] [Report]. Anguelova, M. D., M. Bettenhausen, W. Johnston, P. Gaiser, 2010, Database of satellite-based foam fraction for investigation of whitecaps variability with correlation analysis, 11th MicroRad, 1-4 March, Washington, DC, USA. [Abstract] [Presentation]. Anguelova, M.D. and F. Webster, 1999, Global Whitecap Coverage from Satellite-Measured Brightness Temperature, AGU Spring Meeting, 1--4 June, Boston, MA, USA. [Abstract] [Poster--Title, Page 1, Page 2, Page 3]. Yang, Z., S. Tang, M. Anguelova, and Jin Wu, 1996, Time Variations of Surface Slopes During Steep Wave Breaking, Ocean Science Meeting, 12 - 16 February , San Diego, CA, USA. Barber, R., M. Anguelova, and Jin Wu, 1995, Laboratory Measurements of Spume Drop Production, AGU Spring Meeting, 30 May--2 June, Baltimore, MD, USA. Anguelova, M.D., M. Wo, S. Tang, and Jin Wu, 1995, A Light Sheet for Studying Air Sea Interaction Processes, AGU Spring Meeting, 30 May--2 June, Baltimore, MD, USA. Anguelova, M. D., M. Bettenhausen, W. Johnston, P. Gaiser, 2010, Oceanic whitecaps as progenitors of sea-spray aerosol: Measurements, variability and parameterizations, Invited seminar, 5 October, AeroCenter, GSFC/NASA, Greenbelt, MD, USA. [Abstract] [Presentation]. 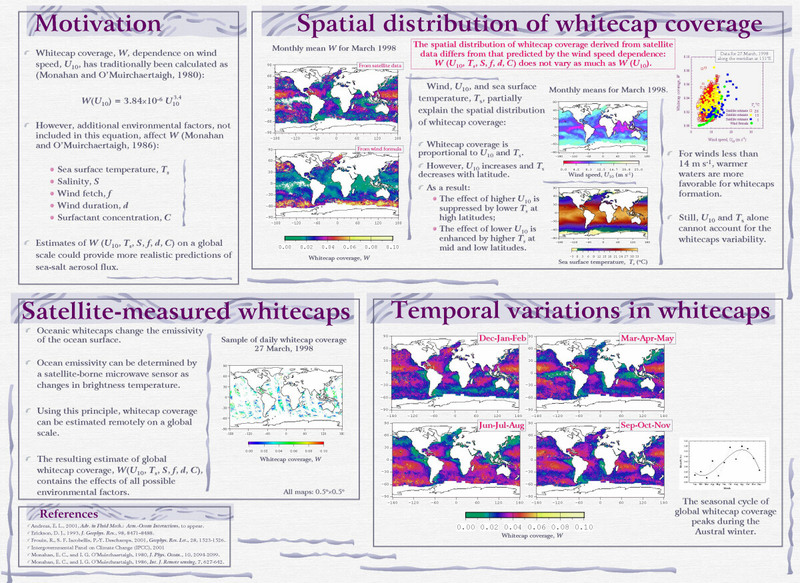 Anguelova, M. D., 2010, Whitecap fraction database for studies of whitecaps variability and its influence on sea-spray source function, Workshop on Primary Marine Aerosol Fluxes, SOLAS Program, 10-11 May, National University of Ireland, Galway, Ireland [Presentation]. Anguelova, M. D., Whitecaps, sea-salt aerosols, and climate, October 18, 2001, Oceans and Ice Branch Seminar, Branch head Dr. C. Koblinksy , GSFC/NASA, Greenbelt, MD, USA. [Abstract] | [Presentation]. Anguelova, M.D., Estimation of Oceanic Whitecap Coverage, Remote Sensing Seminar, October 31, 2000, Instructor: Dr. Xiao-Hai Yan, College of Marine Studies, Newark, DE, USA. [Abstract] | [Presentation]. Anguelova, M.D., Atmospheric ozone: Present and Future Trends, Oceanography Seminar, April 11, 2000, Instructors: Dr. W. J. Ullman and Dr. S. C. Dexter, College of Marine Studies, Lewes, DE, USA. [Seminar theme] | [Abstract] | [Presentation]. Anguelova, M.D., Present the paper: Wind-Forced Cross-Shelf Circulation on the Northern California Shelf, Dever, E. P., 1997, Journal of Physical Oceanography, 27, 1566-1580, Oceanography Seminar, March 9, 1999, Instructor: Dr. David Hutchins, College of Marine Studies, Lewes, DE, USA. [Seminar theme] | [Presentation]. Anguelova, M.D., Measurement of Primary Production Using Satellites, Biological Oceanography, May 13, 1998, Instructors: Dr.D. Miller and Dr. David Hutchins, College of Marine Studies, Lewes, DE, USA. [White paper (pdf)] | [Presentation]. Anguelova, M. D, 2002, Whitecaps, sea-salt aerosols, and climate, Ph.D. Dissertation, University of Delaware. [Proposal] [TOC & Abstract] [Chap1 (Introduction)] [Chap 2] [Chap 3] [Chap 4] [Chap 5] [Chap 6 (Conclusions)] [Appendices] [References]. Anguelova, M. D., 1997, Laboratory Study of Bubble Clouds Characteristics at Various Conditions, M.S. Thesis, University of Delaware, 255 pp. Anguelova, M. D., 1984, Investigation of electron-vibrational absorption spectra of NO2 with a dye laser, Diploma Thesis, Sofia University, Bulgaria. Anguelova, M. D., Oceanic Bubbles and Climate, Coast Day, October 1, 2000, College of Marine Studies, Lewes, Delaware, USA [Presentation]. Anguelova, M. D., The Ocean in the Climate System, Coast Day, October 3, 1999, College of Marine Studies, Lewes, Delaware, USA [Presentation]. 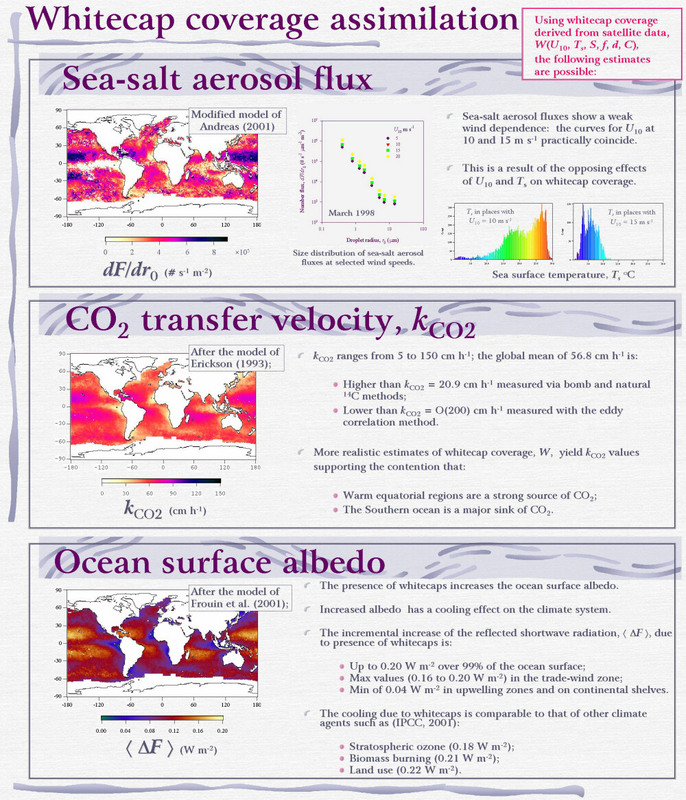 Anguelova, M. D., Atmospheric and Oceanic aerosols and Climate, Coast Day, October 4, 1998, College of Marine Studies, Lewes, Delaware, USA [Presentation]. Tzanev, V., P. Dishkov, M. Veleva, St. Donchev, S. Penchev, M. Angelova, A. Kuznecov, A. Omelianchuk, A. Ushakov, No. 90094, A device for temperature stabilization of microobjects, (in Bulgarian). Stoyanov, D. V., B. M. Bratanov, M. D. Angelova, No. 92075, A device for Doppler signal detection, (in Bulgarian).